Heartbeat selected a highly targeted group of Ambassadors who are interested in a sustainable lifestyle and eco-friendly products. 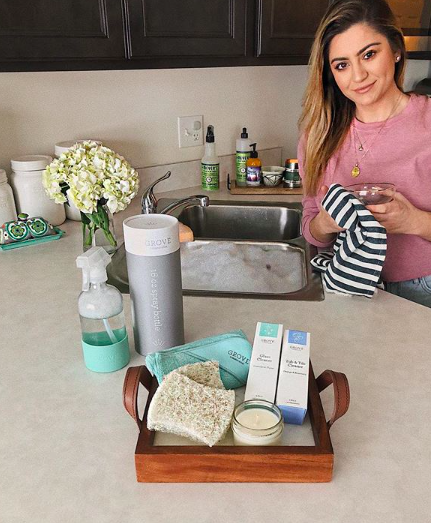 Each Ambassador received Grove’s Cleaning Starter Kit so they could organically capture themselves with the products at home. This led to beautiful lifestyle content and authentic recommendations about Grove’s services to their friends and followers. Grove saw a significant spike in brand awareness from the campaign’s overall social reach and engagement. Since the Ambassador’s content aligned with Grove’s branding, they’re able to repurpose the content on their social channels for other marketing initiatives. Snowy, cold days call for a good cleaning sesh! Plus a glass of wine..or two!😜Sharing some great products with you guys from @grovecollaborative They deliver eco friendly, affordable cleaning products right to your door! Make your home a little greener this year! Get your free grove starter kit by spending 20 dollars on cleaning products today! You won’t be disappointed! They have so many goodies to choose from and if you have kids you’ll definitely appreciate their delivery service! Shop via the link in my bio to get your kit today!